A demonstration of temporal cloaking by researchers from the School of Applied and Engineering Physics, Cornell University, has been published in Nature. The authors propose to create a "time hole" to hide the occurrence of an event from the observer. The key to the process is what's being termed a split time lens, which is matched with a dispersive medium. When activated, the lens takes the light that comes before the point of cloaking and shifts it to bluer wavelengths, which travel faster through the dispersive medium than the base speed of the light in the same medium. At the cloak point, the lens switches, shifting the light beam to longer, redder wavelengths. These travel through the dispersive medium more slowly. 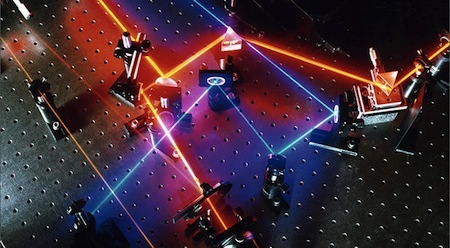 The end result is that a gap develops in the beam of light as the blue light races ahead and the red light slows down. In this cloaking device, that gap maxes out at about 50 picoseconds, long enough for a very brief event to occur (in this case, the event was simply an interaction with a pulse from another laser). The light can then be sent through a dispersive medium with the opposite effect, slowing the bluish light back down while accelerating the red. By the time it exits the device, the gap has been sealed back up and the effects of the wavelength shifts reversed. Any events that took place during the 50 picosecond gap (as long as they occur in both the right place and time) never happened, at least as far as the light beam that exits is concerned. Star Trek fans may recall the Temporal Cold War, in which several time-traveling factions, each from different points in time, sought to manipulate history for its own benefit. The Krenim weapon ship has a beam that can push objects out of the spacetime continuum, thereby erasing them from history. 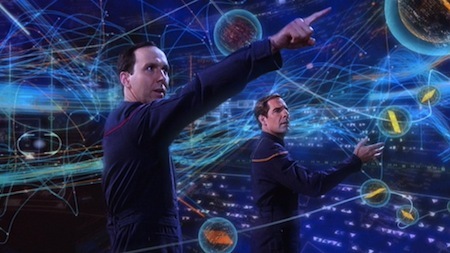 Archer and Daniels are shown below in the Temporal Observatory, a holigraphic representation of the timestream projected by a hand-held device. Read more at Ars Technica; thanks to Moira for sharing the tip and reference for this story.